This year marks the third in the life of Fly in the Fibre. For those of you who may not know its beginnings, here is our story. I purchased a small yarn selection from a friend who had decided she wanted more time to create rather than spend time on the business. Sounds like a problem we all share doesn't it! It was a happy transaction, I was looking for that job that would fulfill me in time and in passion. 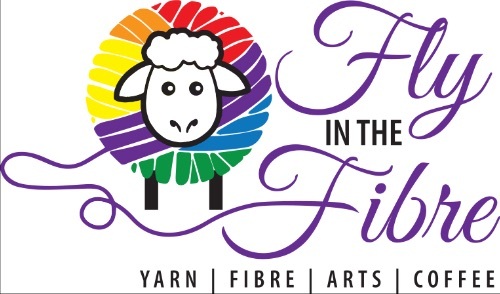 Fly in the Fibre was born on May 1, 2016. The name was chosen by my husband. The name is the perfect blend between the two things I enjoyed the most at the time- fly fishing and the world of fibre. Little did I know the rabbit hole I was headed into with fibre. At its beginnings, Fly in the Fibre was located in a small space on 12th Ave. in Creston. The owner of a hairdressing shop was kind enough to let me stay in there until my feet were a bit on the ground and I could figure out what my vision was going to be. Starting a business wasn't my goal in life, Fly in the Fibre developed through opportunities presenting themselves and the ability to let go of fear enough to grab onto them. The bonus of having Fly in the Fibre in a small space was the personal push I had to build the online presence. It took several months to learn how to do the webpage, add products, and try to give people the same positive experience online as I wanted to give them in a store. www.flyinthefibre.ca was really my first toe into the business world. While I loved reaching out to people and being able to make Fly in the Fibre accessible to the world, I was starting to feel that the store I was beginning to envision would fit well in Creston. I started to look for a space to expand into. We are committed to providing quality yarns and supporting local creators. We want to be connected to our customers and offer a hub where people can come to talk and learn about fibre art. It really is our local artists that make Fly in the Fibre the store it is. Our space is shared with artists of different talents and mediums who share and support the same vision. The colours, the inspiration, and the pure life enjoyment that is portrayed in all the art work makes Fly in the Fibre a wonderful place to put your feet up and to connect with others. The sharing of skills, techniques, and experiences through workshops and classes have become a very important part of the vision. We hope our next year is filled with as many laughs and as many creative moments. Our store continues to grow and we continue to learn. Thank you so much for your support, your presence in our lives is sincerely appreciated. Drop-in on April 2 for our Birthday Party. Coffee specials, birthday cake, store specials. Our theme is Alice in Wonderland so make sure to wear a hat!